Posted in Misc and tagged grammar, RTE News at 4:03 pm on September 4, 2017 by Broadsheet. Who fupping cares? None of them are exactly Mensa candidates. It went over yer head Baggy! Scaaaaarleh for yeh calling them thick! Surely though as a platform for journalism we can hold our national broadcaster to better standards of English than this. Generally I don’t mind idiosyncrasies like this, language is meant to evolve. The “dese, dats, dem and dose” brigade of Irish presenters and voiceover artists set my teeth on edge though. And ‘tas only last week that the Facebook was in an almighty uproar over the fact that RTE were forcing all de presenters to use de Queens English. 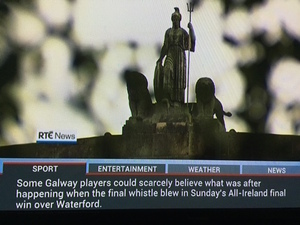 it’s RTE .. just look up ‘RTE blooper reel’ to see the complete lack of standards at play. For a blooper reel, it’s far more technical mess ups than presenters. my fave being “ok, now we just pretend to talk to each other now” (presenter to guests at the end of a show when the credits begin to roll) .. as for this, i wouldn’t be too bothered, its Irish English. They forced us to speak the language, so we twisted it around a bit.. RTE television isn’t for English people, it’s aired here, and everyone knows that “im after going..” way of saying things. Wha? Almost every ad on the radio or TV has a vowel-chewing D4 ‘artist’ doing the voice-over. Lyrics that are a apt today as they were 28years ago…..
Why couldn’t they scarcely believe it? Could they not see the scoreboard? Was it themselves that could scarcely believe what was after happening? 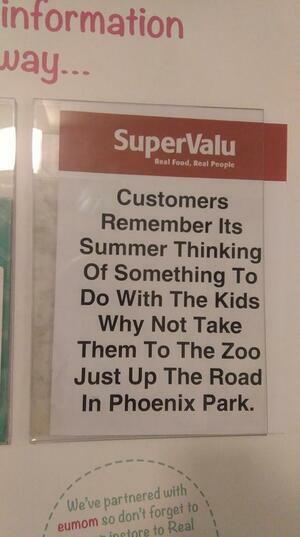 Perfect Hiberno English. You should acquaint yourself with it. You’re only after making a haimes of Synge as we so you are. Aren’t the subtitles generated by a computer based on what the announcer says? “Am’nt” the subtitles. Fixed that there for you. Amn’t. Fixed that for you.